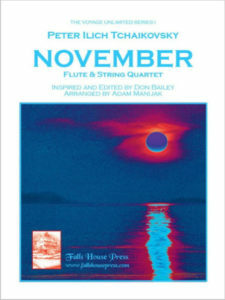 Falls House Press and flutist Don Bailey are pleased to present the Voyage Unlimited Series – collection of new transcriptions of familiar piano repertoire for flute and strings. Inspired and edited by the flutist and orchestrated by Adam Manijak of Poland, works currently available include Ravel’s Sonatine, Tchaikovsky’s November, Köhler’s Papillon, and Paderewski’s Minuet in G.
Recorded by Don Bailey on Voyage (Summit Records), these arrangements have received critical acclaim and global radio play but have not been available for public performance until now. American Record Guide called them “…fresh and interesting”. Fanfare said Voyage was “…a nicely conceived collection covering a broad spectrum. The original works are particularly effective.” Boston’s WGBH Radio offered Voyage as a pledge gift in one of its annual fund drives. Selections from Voyage were performed by Don Bailey at the National Flute Association conventions in Atlanta, GA with members of the Atlanta Symphony Orchestra, in Washington, D.C. with the Voyage Quartet, and in New York City with the Attacca Quartet. The CD and sheet music can be purchased online and in music stores everywhere. The Voyage Unlimited Series II is coming soon. November was one of a set of twelve pieces entitled The Seasons (1875-76) Op. 37b commissioned by the magazine Nouvelliste. The moods corresponded with the titles of the compositions and the magazine’s monthly images. November’s “Troika” has jingling sleigh-bells and whirling notes intended to create an impression of falling snow. Minuet in G was written in the 1880s as part of Paderewski’s set of 6 Humoresques for piano, op. 14, no 1. This version for flute and string quartet was inspired and edited by flutist Don Bailey and orchestrated by Adam Manijak of Poland. 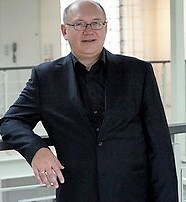 Adam Manijak holds two degrees from the Academy of Music in Łódź, Poland – in piano with honors as a student of Tadeusz Chmielewski and in composition, also with honors, as a student of Jerzy Bauer. He served as Mr. Chmielewski’s assistant at the Academy for five years. Adam took part in many piano competitions including the Chopin Scholarship Competition in Warsaw and the I Szymanowski Piano Competition in Łódź. In addition to his solo recitals, chamber music concerts and recordings in Poland and abroad, he performed aboard the Cunard cruise ship Vistafjord for four years with the Vistafjord Orchestra until he joined Classical Quintessence with flutist Don Bailey. Among his compositions are Concerto for Piano and Orchestra and Trio for Violin, Double Bass and Piano. His activities also include jazz and music for the theater. Currently, Adam is a lecturer in The Chair of Chamber Music in the Academy of Music, Łódź. Bailey and Manijak continue their collaboration through Voyage Unlimited, Inc.
Tchaikovsky’s November was one of a set of twelve pieces entitled The Seasons (1875-76) Op. 37b commissioned by the magazine Nouvelliste. The moods corresponded with the titles of the compositions and the magazine’s monthly images. November’s “Troika”, has jingling sleigh-bells and whirling notes intended to create an impression of falling snow. Polish born pianist and composer Ignace (Jan) Paderewski entered the Warsaw Conservatory in 1872. Strict curriculum requirements forced him to play many instruments, including trombone, flute, viola, and clarinet. He was appointed teacher of piano at the Conservatory in 1887, and his performances worldwide, including a Carnegie Hall debut on November 17, 1891, were consistently triumphant. Paderewski was considered the richest living musician in the world before the first World War but gave away most of his money in the service of Poland. Minuet in G was written in the 1880s as part of his set of 6 Humoresques for piano, op. 14, no. 1. Italian composer Ernesto Köhler studied flute with his father. He was first flute of the Court Orchestra at Modena, later at the Karl Theater in Vienna, and in 1871 of the Imperial Orchestra in St. Petersburg. Köhler wrote numerous works for flute, from educational studies to compositions for intermediate through virtuoso flutists. His Papillon (Butterfly) is one of many short character pieces for flute and piano. Ravel had an unsurpassed command of the orchestral medium and often orchestrated his own piano works – Ma Mère l’Oye (“Mother Goose”), the Valses nobles et sentimentales (“Noble and Sentimental Waltzes”), and the popular Pavane pour une infante défunte (“Pavane for a Dead Infant”), among others. His Sonatine, an early work for piano solo (1905), was first transcribed for flute, cello and harp by harpist Carlos Salzedo. This version for flute and string quartet was inspired and edited by Don Bailey and orchestrated by Adam Manijak of Poland.